Tapir and Pig, both without siblings, see each other daily at the waterhole. They acknowledge a commonality and see one another as the same, but different. An immediate bond is formed; one so strong, they decide that they are brothers from a different mother. The friendship strengthens. They play, chase butterflies and roll in the mud. They are sublimely happy together until the day Father Pig admonishes his son and points out what he sees as unacceptable differences between them. Father Tapir does the same. The two hoofed animals are separated. Alone and lonely, they realize their separation is ridiculous. Both set out in search of the other. At the same time the fathers go in search of their runaway children. At the waterhole, with the youngsters covered in mud, can the Father’s discern which is their son? Phillip Gwynne’s uses the similar hoofed animals to draw attention to race differences which are invisible when it comes to children creating friendships. Commonality is what kids look for. His cleverly crafted story points out that in the eye of the beholder, perception is everything. The text is superbly translated and complemented with insightful illustrations by Marjorie Crosby-Fairall. 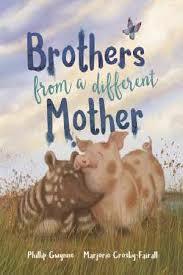 This book is ideal for class discussions about differences and similarities, and what defines humanity and perception.